The Target Ruin is located in the upper Butler Wash area west of Blanding, Utah. Much of the ruin is housed in an inaccessible alcove where at least one room appears to be remarkably well preserved. 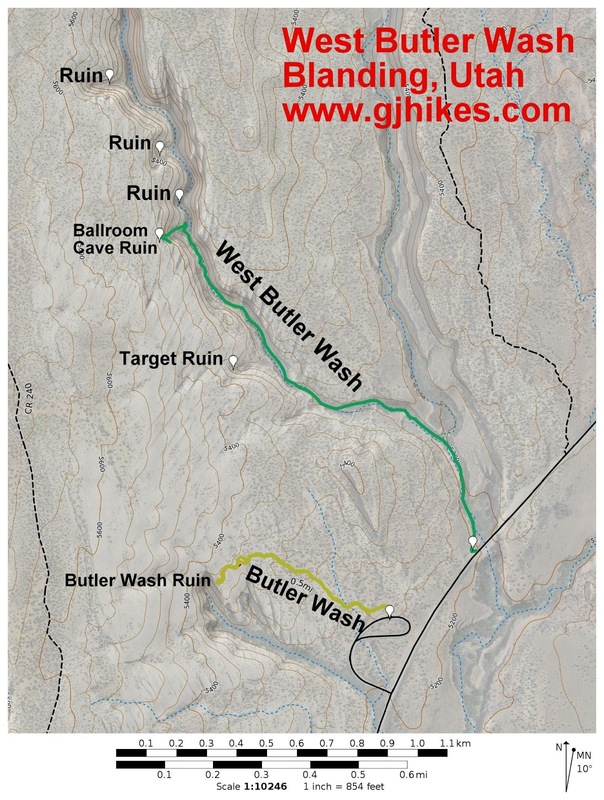 Even though the ruin is within 1 mile of the highway it's location isn't at all obvious and many visitors to this portion of Butler Wash unknowingly pass right by it. To get to the trailhead from Blanding drive 4 miles south on Highway 191 and turn west onto Highway 95 toward Natural Bridges National Monument. Continue for another 10.2 miles and park at the pullout on the righthand side of the road immediately after crossing the bridge over Butler Wash and right before the sign for the Butler Wash Indian Ruins. From the parking area pass through the gap in the fence where there is a trail register to sign before beginning the hike. 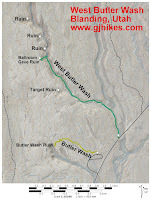 As the trail starts out it drops into the wash and follows it upstream. In contrast to most other washes in the area this part of Butler Wash is lined with towering cottonwood trees. Early in the year the ground is covered completely by the cotton that falls from the male trees. During the fall there is no longer any sign of the cotton and the ground is this time covered by a fresh mat of leaves. 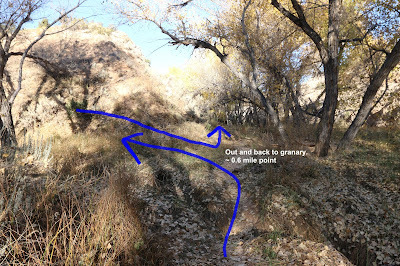 Just past the half mile point there is a side canyon that leads up to a granary. If you decide to go see it stay on the trail that is closest to the wash of the side canyon. At times the trail will be down in the wash but in other places it climbs out of it to get around obstacles. The granary is tucked away beneath an overhang in the upper reaches of the side canyon. Back in the main wash it is only a short distance further to the turnoff that leads to Target Ruin. The easiest route to the ruin is by scrambling up a short bit of slickrock where the canyon that the ruin is in spills into the main wash. Many people hike a little further and climb the steep sandy bank to get out of the wash. It is much much easier if you can get a friction hold on the lower ledge of the slickrock and begin working your way up it. It is only about 4 or 5 feet before the ledge widens and the rest of the way becomes a cinch. We have gone up and down it with ease several times. Once you make it up the first little bump you can see on up the wash to the main ruin. There are ruins on both sides of the wash just below one of the most vertical high spillovers that you can find around these parts. Better views of the ruins that are up in the alcove on the north side of the wash can be obtained while hiking up to the alcove on the opposite side of the wash.
One of the rooms has a roof that is completely intact. Looking closely it is also apparent that this room was painted on the outside at one time. Several of the other rooms were built up all the way to the top of the alcove using it for a ceiling. A granary can be seen while looking through the main opening in the outer wall. 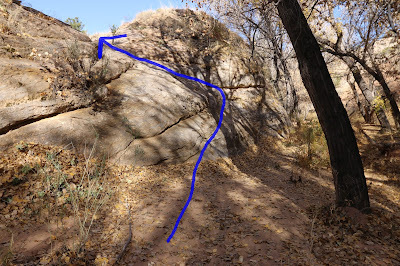 There is another granary hidden away in a crevice on the south side of the canyon. In the south alcove most of the ruins are piles of rubble. There is a large boulder here where much grinding has been done. I wonder what the mechanics of grinding corn and seeds is that necessitates the beginning of a new groove. For grooves that are at least a hand width apart you can imagine more than one person grinding at the same time but for those that are very close together it seems that it would have been difficult to have someone else working so near. There is a petroglyph that looks like a target on the wall behind the grinding stone for which these ruins were probably named. There are 4 other ruins on up Butler Wash. Ballroom Cave is the largest of them and it also has some pictographs and an ammo box with information about the ruin. Target Ruin is better preserved than the others. At least the parts of it that are in the inaccessible alcove. We were left wondering if it was better preserved because it was sheltered by the alcove or because nobody can get up to the alcove and crawl all over the walls. Perhaps it is a little bit of both of those reasons. That should be good incentive for everyone to tread lightly when visiting the archaeological treasures of the past and do nothing that would harm them in anyway. If you would like to see it for yourself then all you have to do is 'Take a hike'.